Mono-tube gas shock absorber with large diameters allows for lower operating temperatures and pressures. This prevents aeration inside the shock absorbers and gives maximum reliability. Using shim stacks for compression and extension damping, our suspensions are meticulously calibrated to provide excellent bump and rebound performance, in both high and low acceleration conditions. Unique piston design gives instantaneous control and plush ride under all conditions through a fixed minimum bleed and multiple flow-rates cavities. As such a combination of comfortable low speed damping and sporty high speed damping rates are achieved. 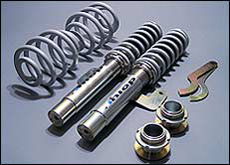 Shock absorbers are serviceable, seals are replaceable, and may be re-filled with gas. All spare parts are available. The Floating Piston and Valve Body has double 'O' rings to stop FLUTTERING and minimize bore wear resulting from piston to bore contact. This reduces the build-up of metal particles in the oil, which normally causes excessive 'O' ring wear; resulting in reduced performance of the shock absorber. Our coil over suspension is front/rear height adjustable, up to 70mm. Comes in "Comfort" setting and "Sport" setting. "Comfort" setting is for street driving and "Sport" setting is designed as a compromise for street and Clubman's competition. Customer individual track settings may be ordered at a minimal additional cost. Due to the excellent engineering of our systems, we confidently offer a 2 year warranty.